7 Short 1 Long serves food that's way beyond the Goan food you eat at other eateries. What makes it even special is that this has four women at the helm of affairs. From the mother Clara Braganza whose traditional and bona fide Goan masalas and preparations are a hit; to the neice Gladiola, the chef who mastered traditional recipes and is always gung-ho to experiment; to another niece Marisa who comes in to prepare the tongue chilli and other specialities; and the boss girl, Belinda Braganza who's a foodie to the core. So when the parents agreed to dinning out, I thought why not go back to my grandmother's village and check out what's so great about 7 short 1 Long in Raint, Moira, quite close to the church. I had mixed thoughts like it could be either one of those places started just to allow villagers to taste some food within proximity or it would be outstanding that generally makes people travel anywhere for good food. The verdict: It has great food. In a 10-year-old bungalow that's built like an Indo-Portuguese house, the place is run by retired shippies (boatkar like we say in Konkani) Belinda and Gladiola. Probably now you get why it's called, 7 short 1 long; that's the general alarm on the ship. So they abandoned the ship after over a decade of service to open this place which is a dream come true and a passion they share. Open for dinner every day except on Mondays, they serve lunch on weekends only. From the quiet ambience and setting in the balcao and verandah, to the hospitality and warmth of those involved, the experience can create lasting memories. 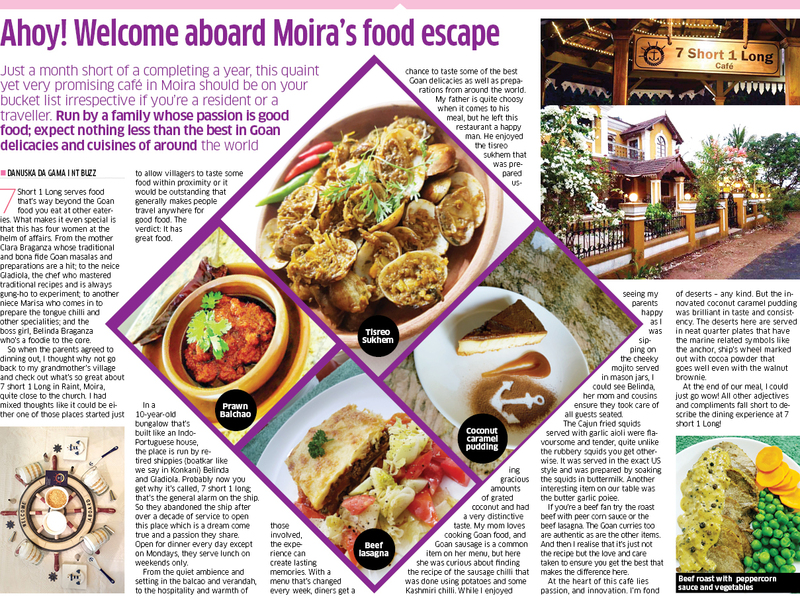 With a menu that's changed every week, diners get a chance to taste some of the best Goan delicacies as well as preparations from around the world. My father is quite choosy when it comes to his meal, but he left this restaurant a happy man. He enjoyed the tisreo sukhem that was prepared using gracious amounts of grated coconut and had a very distinctive taste. My mom loves cooking Goan food, and Goan sausage is a common item on her menu, but here she was curious about finding the recipe of the sausage chilli that was done using potatoes and some Kashmiri chilli. While I enjoyed seeing my parents happy as I was sipping on the cheeky mojito served in mason jars, I could see Belinda, her mom and cousins ensure they took care of all guests seated. The Cajun fried squids served with garlic aioli were flavoursome and tender, quite unlike the rubbery squids you get otherwise. It was served in the exact US style and was prepared by soaking the squids in buttermilk. Another interesting item on our table was the butter garlic poiee. If you're a beef fan try the roast beef with peer corn sauce or the beef lasagna. The Goan curries too are authentic as are the other items. And then I realise that it's just not the recipe but the love and care taken to ensure you get the best that makes the difference here. At the heart of this café lies passion, and innovation. I'm fond of deserts - any kind. But the innovated coconut caramel pudding was brilliant in taste and consistency. The deserts here are served in neat quarter plates that have the marine related symbols like the anchor, ship's wheel marked out with cocoa powder that goes well even with the walnut brownie. At the end of our meal, I could just go wow! All other adjectives and compliments fall short to describe the dining experience at 7 short 1 Long!